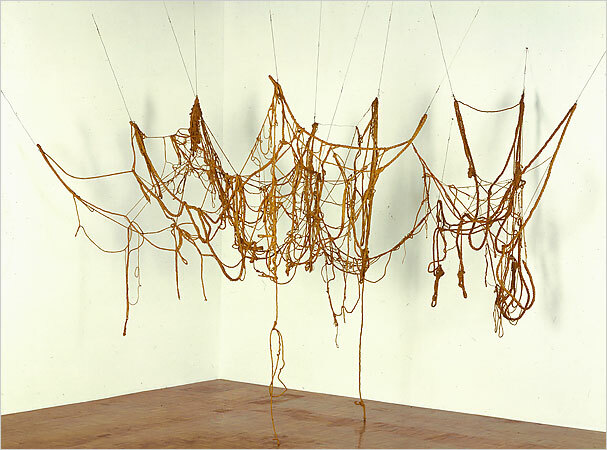 I’ve always loved Eva Hesse’s work. It’s luminous and beautiful—but deadly. She died at 34, of a brain tumor, probably from the toxic materials she worked with. Her work is hard to preserve (minus the fiberglass) and there’s something about the almost momentary aspect of her work that I find incredibly romantic. Sculptures are often very Permanent Structures. There is beauty in permanence, of course, but I think I am drawn to things with a more temporary nature. After college, I found myself with too many sculptures. What exactly does one do with a 5’ 3” monstrosity of plaster, wire and wood? At the time I’d been watching a few documentaries on Andy Goldsworthy and casting my sculptures out into the elements seemed like a clear progression. Things break, things disappear. (Things fall apart, the center cannot hold.) Eva Hesse died at 34, after only a decade of creating art. I’m 5 years away from that mark, and I don’t know what sort of legacy I would leave. I re-read much of my old work and it feels tragic and sad—I want to leave a legacy of more laughter and joy. I think of myself as someone quick to smile, easy to laugh. I take things seriously, sure. But I find so much beauty around me as well—so much to revel in. I don’t know why I’m suddenly full to the brim with project ideas. I want to work on my masks, I want to work on my climbing-poem-sequence. But I also want to work on something ACTIVE. I talked with my best friend about portraits— if he were here, he’d be taking them for me. As he is still in Philadelphia and seems to refuse to move to Seattle simply because I want him to, I think I’ll do it on my own. One of the things fueling me lately is an old piece from school. While I was in college I was part of a performance art collective, and I did a very ridiculous piece one night, stripping down to almost nothing, forcing the audience to watch my body fail as I stood on my tip-toes on a stool, with my arms outstretched and heavy dictionaries in each palm while an audio collage of my voice, reading various definitions of Performance Art, played in the background. At first, when I stripped down, the crowd cheered. And as I stood there, they grew uncomfortable. As my body flushed red and my muscles started to fail there was a switch—the audience wanted me to succeed, to keep going, even though there had to be an ending of sorts. I was too strong for the piece—if I’d timed it properly my body would have forced me to the ground. As it was, the recording ended, I dropped the books and let myself fall. It feels very pretentious now, but I still like the idea of failure—of pushing myself to a limit and past that point. I realized last night, bouldering with a friend in a crowd of people I didn’t know, there’s a similar energy. I sat back, watching men move from one hold to another, and caught my breath as they made a move that, earlier, had sent them crashing to the mats. You can feel a collective breath release as someone moves past, and up. Somehow, this has to translate into art again. I’m going to figure out how. Update: I found old pictures from the initial performance. Turns out I was not as naked as I thought. Click the photo to see more from our collective, Peddle to the Meddle.